One of the more pernicious of the enduring fallacies of the Brexit zealots is the belief that leaving the EU with only a free trade agreement to sustain us will relieve the bulk of UK businesses from their obligations to comply with EU law. Most British companies do not export at all, yet they are burdened with regulations designed for exporters. In 2013, the Office of National Statistics (ONS) found that, of 1,979,600 businesses in the UK, just 223,000 export at all. That leaves 1,756,600 businesses (89 percent of the total) that never export, but are still subject to often draconian EU Single Market legislation. Richards went on to quote work that had suggested that no more than 4.27 percent of UK businesses exported to the EU, then asking (rhetorically): "Where's the sense in a hundred percent of British businesses being subjected to EU Single Market regulations that need only apply to five percent of them?" Nevertheless, we gets the likes of Peter Lilley and many other arguing for trade agreements such as the Canadian CETA (Comprehensive Economic and Trade Agreement) as a suitable model on which to base future trading relations with the EU, precisely because it will only apply to those businesses engaged in export. Brexit, therefore, will allow the UK their yearned-after bonfire of laws, leaving the majority of businesses free to ply their trade under the more benevolent and less rigorous write of domestic law. It is often further argued that we can adopt the CETA model for trade with the EU because it allows us abandon the damaging regime of regulatory harmonisation which is a feature of the Single Market. Instead, we can rely on mutual recognition of each other's standards, as long as there is rough equivalence between them. However, even before CETA was agreed, the writing was on the wall, with Swedish economist warning that the EU had not in any way conceded equivalence in its technical regulation, and was boasting that no regulations had been changed as a consequence of the agreement. Now, the agreement coming into force, the Canadians are beginning to learn the hard way that, when you dine with the devil, you need a very long spoon – that lesson coming by way of the specialist Canadian agricultural journal, the Western Producers. 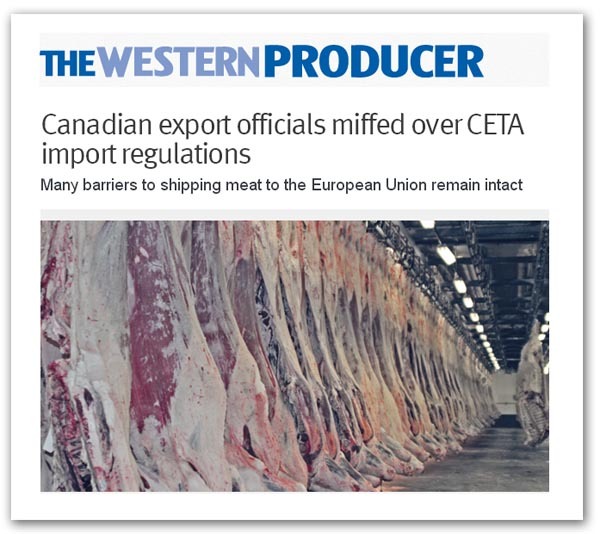 Canada's free trade accord with the European Union, it observes, has failed to remove many of the barriers to shipping red meat to Europe, then offering a quote from Ron Davidson, head of international trade for the Canadian Meat Council. He says: "We do not have what we would call commercially viable access to the European market". Under the Comprehensive Economic and Trade Agreement (CETA), Canada is allowed duty-free exports of 81,011 tonnes of pork, but three obstacles stand in the way. Firstly, the EU wants trichinella-free product and Canada is not officially recognised as free of the parasite, which can be transferred from pork to people in raw or undercooked meat. It is hoped a trichinella-free standard could be developed according to guidelines set out by the World Organization for Animal Health. However, that would be expensive and there is no certainty the EU would accept it. The quota with the EU includes fresh and frozen meat. Secondly, the EU also requires its own health mark on boxes of meat over a tamper proof belt at the time of manufacture in the processing plant. The boxes go into a refrigerator and the serial numbers on the health mark must be in sequence. That would create a lot of additional handling logistics for Canadian companies who ship to many other markets outside of Europe. Thirdly, Canadian meat processors also express problems with equivalency inspection requirements with the EU. "We supposedly do have equivalence in the meat inspection systems. If it is a real equivalence, the Canadian Food Inspection Agency stamp should be sufficient", Davidson says. Nor does the pain stop there. On the beef side, Canada was granted duty-free exports of 64,950 tonnes of beef and veal. Here, there is the stumbling block on the use of antimicrobial treatments to remove pathogens like E. coli. Because Europe would not be buying entire carcasses, Canada would be left with items like trim used for grinding meat. Those are exported to the United States, where there is a zero tolerance policy for E. coli. That means the entire carcass is treated with antimicrobials in Canadian packing plants to avoid the risk of losing the US market. "If we turn off interventions, the risk of having an incident at the U.S. border goes up", Davidson says. Canada plans to submit applications to Europe for the addition of two antimicrobial products, which are like vinegar and citric acid. The EU has approved lactic acid for washing carcasses, halves and quarters. Meanwhile, European meat suppliers have wide open access to Canadian markets. "The day that CETA goes into effect, the 26.5 percent tariff comes off so the European Union is going to have a huge opening of the Canadian market for beef and veal", Davison adds: "The agreement is not balanced. We would just like to be able to take advantage of the quota we've got". And there lies a story all on its own. According to the Irish Examiner, although Canada gets an extra 50,000 tonnes of tariff-free quota for its beef, it must be high-quality, hormone-free beef. Currently, the US and Canada only take up three percent of their combined 11,500 tonnes tariff-free annual quota that is already in place. It is likely Canada may be unable to avail itself of the additional CETA quota. Furthermore, sources in the Canadian beef industry say it is unlikely any of their larger processors will have much interest in trade with the EU, because the EU also rejects antimicrobial washes used in Canadian beef plants. In this is the Canadian dilemma. In seeking to service two markets with conflicting regulatory regimes, the incompatibilities are such that producers must choose to service one or the other. They cannot do both, and maintain profitability. Had they looked at the small-print in CETA, however, they would have seen this coming. The chart on page 302, for instance, shows that the EU is not in the least interested in regulatory equivalent – only obedience. In order to export meat to the EU, producers must obey Regulation (EC) No 852/2004 on the hygiene of foodstuffs; Regulation (EC) No 853/2004, laying down specific hygiene rules for on the hygiene of foodstuffs; Regulation (EC) No 854/2004, laying down specific rules for the organisation of official controls on products of animal origin intended for human consumption; Commission Regulation (EC) No 2073/2005 on microbiological criteria for foodstuffs; and Commission Implementing Regulation (EU) 2015/1375, laying down specific rules on official controls for Trichinella in meat. And yes, that does mean, as the Canadian Meat Inspection Agency concedes, that every Canadian meat establishment must be approved by the EU, and listed on the official schedule, before it can export to the EU. The meat must be stamped with the official EU-approved health mark (thereby making it unmarketable in the US) and, of course, on arrival at its EU port of entry, the meat must be routed via a Border Inspection Post, where it must be subjected to special checks (for a fee) before it can be passed to customs for clearance. In other words, the free trade agreement does not give Canadian meat processors a free pass into the EU. They are treated just like any other "third country" – just as the UK will be when it leaves the EU. It could be argued, of course, that the EU law only applies to establishments which choose to export to the EU. And that is true. Those that do not wish to export can adopt the local, equally rigorous but different Canadian regulations, or the US federal regulations if they wish to trade with their closest neighbour. However, if the Canadian plants do elect to trade with the EU, they cannot pick and choose, switching conformity on and off to suit the market they are servicing. In order to export, they must be approved establishments, which means they must go through the laborious processes of demonstrating full conformity with EU law, which must be maintained if they wish to stay on the approved list. For UK establishments, servicing their closest external markets, this presents a "no brainer" choice. Even if ten percent of the product is exported, the business must comply one hundred percent of the time. And even if there are no direct exports, most plants feed into the wholesale market, produce from which is exported. Then, much of the meat ends up with food manufacturers which will export (or may want to export) a portion of their processed food to the continent. And since they don't want to run parallel production lines, and different handling and labelling regimes, they will demand from their suppliers EU-compliant product. Those meat plants which restrict themselves only to the domestic market, therefore, will tend to find their market very restricted indeed, often becoming part of a second-tier low-price market, shunned by supermarkets and chain outlets. As we found before EU meat hygiene standards became compulsory in this country, with the advent of Directive 91/497/EEC, most plants complied "voluntarily". In practice, they had no choice. It was either that, or exclusion from the volume trade. In the Canadian instance, the bigger, more attractive and more profitable export market is the US. Producers there will continue to service this market. CETA does them no favours. As the man says: "We do not have what we would call commercially viable access to the European market". Elsewhere, he had already complained that the deal was "unbalanced" against Canadian meat. For the UK, a free trade agreement with the EU will require de facto conformity with the entire EU animal health acquis just as it does now. And this will bleed into other sectors. Medicines producers, for instance, will not be putting their products through separate UK and EU approval systems – they will have to choose one of the other, and most will go for the EU standard, to take advantage of the bigger market – even if just a small part of their production is exported. The same will apply to chemicals, to motor cars, aircraft spares and components, cosmetics, construction materials, and much, much more. Effectively – except at the margins (where derogations often exist anyway), business will still be dominated by EU regulation. This makes the rejection of the "Norway option" a cruel irony. At least in the EEA, we would have had some input into the Brussels machine. As free trade "partners", we will have none at all. Except, of course, we will be able to pursue our interests in global standard-setting bodies, but we could have done that as members of the EEA. Altogether, though, as the Canadians are finding, free trade agreements with the EU do not offer equivalence, much less equality. They simply offer another opportunity for traders to obey yet another set of laws.